AVON : Eurasian Starling (Sturnus vulgaris) - glossy black with shiny speckles. Long beak. Voice is a consistently irritating variety of tuneless squeaks, squawks and whines. Annoying habit of being everywhere. Should not be confused with the Great Bustard. 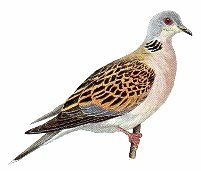 JENNA : Turtle Dove (Streptopelia turtur) - slender, graceful, rather pretty to look at but doesn't actually do a great deal. VILA : Reed Warbler (Acrocephalus scirpaceus) - small, drab, unassuming appearance. Spends a lot of time in deep cover, but easily lured out by its strong inquisitive streak*. Very vocal, but song is as incessant as it is monotonous. Noticeably flighty when disturbed or agitated. * You can do this by making 'pish-pish' noises. Honest. I've done it and it works. CALLY : Chiffchaff (Phylloscopus collybita) - tiny, dull green, with incredibly thin legs. Voice largely consists of feeble 'seep seep' calls. Ability to always be in the bush immediately beyond the one you're peering into suggests possible telepathic capability, but if so then nearly all birds have got it. GAN : Greylag Goose (Anser anser) - large, dull, ponderous and generally unmemorable. TARRANT : North American Ruddy Duck (Oxyura jamaicensis) - an introduced species that has no right to be here. Decorative in appearance and resourceful in its ability to colonise suitable sites, which might be the underlying cause of a perennially smug expression and pertly upright tail. Currently the subject of a controversial culling programme, which I happen to be all in favour of. DAYNA : Eurasian Jay (Garrulus glandarius) - gaudy and raucous, with a pronounced sense of curiosity (though not, perhaps, a healthy one as such). Attractive appearance belies the way it bullies smaller species. Very rarely heard singing. SOOLIN : Great Grey Shrike (Lanius excubitor) - predominantly grey plumage, but nevertheless rather attractive in a cold, stark way. Largely silent, and seen mostly towards the end of the year. Also known as the Butcher Bird. SERVALAN : Goshawk (Accipiter gentilis) - a majestic predator, pronouncedly deep-chested, with many plumage phases. 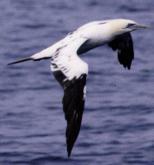 Known to chase after Starlings, but will also go after larger prey. Inhabits dense and intriguing forests which it negotiates with ease. A tenacious species, surviving all attempts at persecution. TRAVIS I : Raven (Corvus corax) - large, black, stern and sinister. TRAVIS II : Coot (Fulica atra) - somewhat smaller but still black, though nowhere near as stern and not really sinister at all. Honks a lot. ZEN : Long-eared Owl (Asio otus) - just sits there doing nothing. What it does when no one's looking is a mystery. ORAC : Sanderling (Calidris alba) - very fidgety, ceaselessly pattering about, and appears resentful at being disturbed. SLAVE : Ring-necked Parakeet (Psittacula krameri) - recently released into the wild and has unfortunately managed to establish itself. Almost painful to listen to, especially given its habit of making itself heard at every opportunity. Classified as a pest, or if it isn't then it damn well ought to be.